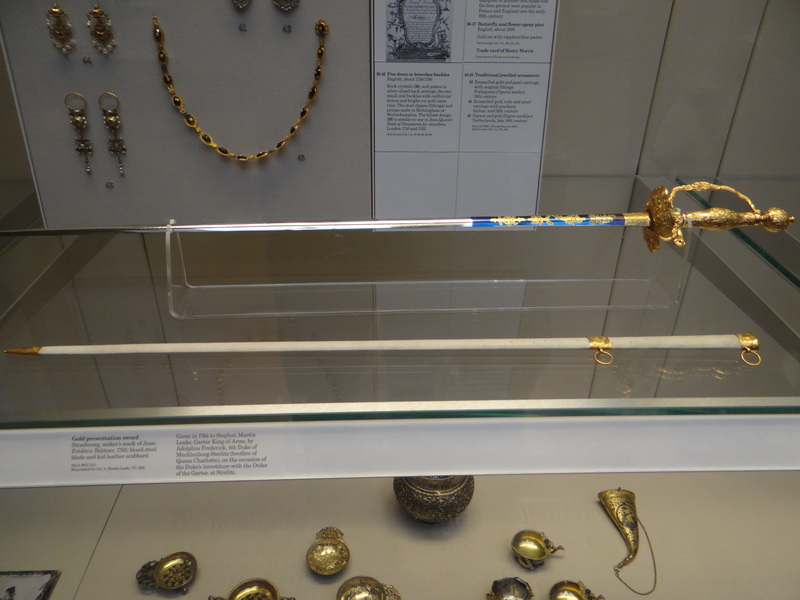 Tizona – This is one of the swords carried by El Cid. It’s currently on display at the Museo de Burgos in Burgos, Spain. Durandal – Roland’s sword, as mentioned in the Song of Roland. Grus – Belonged to Boleslaus the Wrymouthed, also known as Boleslaus III, the 11th century Prince of Poland. Legbiter – Magnus Barelegs, otherwise known as Magnus Olafsson, King of Norway at the end of the 11th Century. Skofnung – Hrólf Kraki, the 6th century Danish King. Zulfiqar – Ali ibn Abi Talib, who said it was given to him by the prophet Muhammad. Its image was used on banners and flags of the Ottoman Empire. The Sword of Goujian – Goujian, King of Yue, a state in Ancient China. This bronze sword was discovered in 1965 and dates back to the 6th century BCE. Curtana – The coronation sword of the monarchs of England, also known as the Sword of Mercy. It is on display along with the British Crown Jewels at the Tower of London. Koryû – Kusunoki Masashige, a 14th century samurai. Koryû means “little dragon.” This is considered one of the national treasures of Japan and can be seen at the Tokyo National Museum. Dyrnwyn – Rhydderch Hael. Dyrnwyn is Welsh for white hilt; the sword had an ivory hilt. The Sword in the Stone – San Galgano. This is currently lodged in a stone inside a glass case in a round chapel on top of Montesiepi in Tuscany, Italy. Dôjigiri Yasutsuna – Minamoto no Yorimitsu, a 10th century samurai. Called Monster Cutter, this tachi is currently housed at Tokyo National Museum. Murgleys – Ganelon’s sword, as mentioned in the Song of Roland. This was called Mulagir in Germany and was described as having a carbuncle on the pommel. Lobera – Ferdinand III. Called Wolf Slayer, St. Ferdinand’s sword is currently housed at the Cathedral of Saint Mary of the See in Seville, Spain. And the fictional people and swords I added as red herrings? Damocles was tested by a sword of Dionysius, which apparently did not have a name. Amir Arsalan – Shamshir-e Zomorrodnegar, from Persian legends. Sigurd – Hrotti was the sword Sigurd claimed from the Dragon Fafnir’s horde, from Norse/German mythology. Richard Cypher – carried the Sword of Truth, from the fantasy series of the same name. Michael Moorcook’s sword & sorcery character Elric of Melnibone was cursed to wield the soul-drinking sword Stormbringer. Fergus mac Róich – wielded Caladbolg in Welsh mythology. Derfel Cadarn – the champion of Dumnonia, in the Arthurian legends, wielded Hywelbane. Arya Stark, from A Game of Thrones fantasy series, wielded Needle. Bastian’s sword, from The Neverending Story, was Sikanda. Narsil – The sword of Elendil, the shards of which were broken and later reforged into Anduril, wielded by Aragorn, son of Arathorn, etc. in the epic fantasy The Lord of The Rings. The Master Sword – Link’s sword, from the Zelda video game series. The Vorpal Blade – The sword of Gary Gygax in Dungeons & Dragons roleplaying games… +5 against Jabberwockies! The Sword of Omens – Lion-O from the cartoon Thundercats. Shannara – the uber sword from the Sword of Shannara fantasy books. Fragarach – Sword of Manannan mac Lir in Irish mythology. Eckesachs – Belonged to the legendary hero Hiebschwert of Germanic legends. Arondight – Lancelot’s sword of the Arthurian stories. Gram – Odin’s sword, broken by Sigmund of Norse mythology. Cthrek Goru – Torak’s sword from The Belgariad fantasy series. If you took this quiz, then you are a SCAdian. Hooray! You won.